Willians Astudillo is one savvy motherforker. He’s not even 27 years old yet but he’s got the savvy moves of a much older, wiser veteran. We already know that Astudillo is sneaky. Behind the plate during spring training, Astudillo caught the Yankees’ Shane Robinson napping off first base with a brilliant no-look throw. It was a move Astudillo has pulled out several times in his winter league career in Venezuela. On Wednesday night, however, he was at third base and the crafty Astudillo pulled the hidden ball trick out in broad daylight. Let’s break this sucker down for a moment. The throw comes in from right field, relayed to third where Tigers’ prospect Dawel Lugo had just advanced. Astudillo, who catches the ball on a hop, looks around to find former Twins player Doug Mientkiewicz, the manager and third base coach of the Toledo Mudhens, approaching Lugo for a quick chat and confidence builder at the bag. Astudillo told MiLB.com’s Josh Horton afterward that this was when he knew they had a chance to pull it off. "As soon as I got the ball, I looked at the third-base coach [Toledo skipper Doug Mientkiewicz] and the runner, and they were looking different ways. Petit was the only one who knew that I had the ball in the glove, and then the pitcher, and it worked. It worked the whole time," Astudillo told Horton. On the mound at the time was recent acquisition Chase De Jong. From De Jong’s perspective, he thought Astudillo was messing around. It was great salesmanship all around as Lugo, of course, started to wander off the base and Astudillo quickly applied the tag. It’s a rarity for sure, but things like the hidden ball trick are one of the reasons why baseball might just be the greatest game on Earth. Heh, I’m sure Mientkiewics begrudgingly tipped his cap at that play. And perhaps Astudillo gets away with it because he’s not a veteran. It’s unexpected. Bet he never gets another hidden ball chance, but who knows? Great sell by the pitcher De Jong, too. This is a player that DID HE GET A CHANCE WITAH THE TWINS. Is he a better backup than, say, FIeld or Grossman, or even Wilson? You can have him as the third catcher. Actually, I would like to see him right now in place of Morrison. But chances are he will NOT get a September callup for some unheard of reason and drfit away to another organization. After De Jong messes with his cleats and tosses the rosin bag down, is he not considered "astride of the pitching rubber" when he walks up next to the rubber? I wondered about the legality of the play since the pitcher did step on the mound without the ball just before the tag, which I thought would be a balk. However, Astudillo got the ball while play was still live, no timeouts called after the runner advanced to third. Luckily Chase De Jong had the wits to wander behind the mound for a bit as Astudillo strolled back to third. De Jong did not deliver the ball to Astudillo, so I guess as long as he didn't actually touch the pitching rubber there's no balk. Willans Astudillo should be playing for larger crowds than in Rochester. The guy is pure baseball entertainment. He's a Rosario type, even if he's not an impressive physical specimen. Utility infielder/outfielder, plus backup catcher. Pinch hitter that always gets bat on ball. That's getting on towards pretty handy. It's also a balk if the pitcher is "astride of the rubber".. which means not touching it, but straddling it? It appears De Jong is close to doing that but must not have. AWESOME! That's a story he will have forever. Mient had to be loving it and hating it at the same time. Right, so it's up to interpretation of the umpire on 'intent to deceive the runner. 'If the pitcher gets into the stretch on the rubber without the ball, certainly a balk.If the pitcher straddles the rubber to make it look as if they are in the stretch while they are not, umpire MAY call a balk.If the pitcher momentarily straddles the rubber in an attempt to walk across the mound and do something else like get the rosin bag, the umpire may (but likely not) call a balk, depend on apparent intent to deceive the runner. I'd say the way De Jong approached the mound could have honestly gone either way. 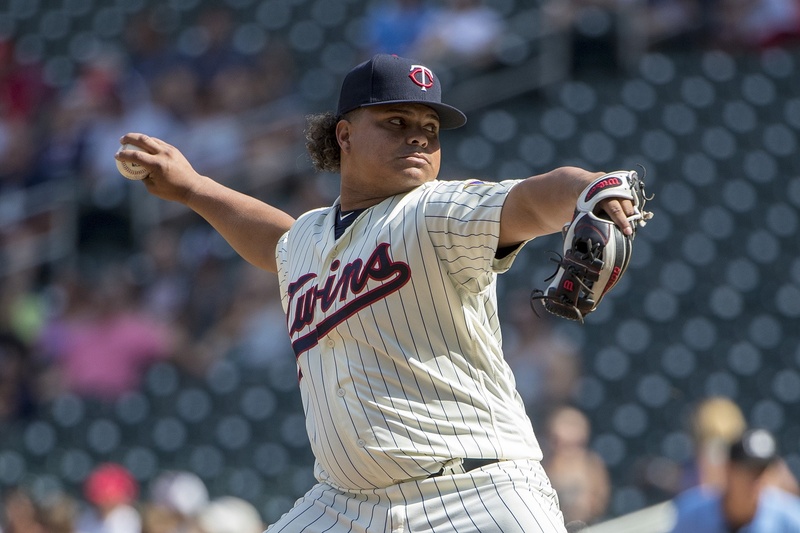 Not really sure why Astudillo wasn't given more of a shot.He certainly proved his versatility when he had his brief cup of coffee with the Twins earlier.I get it, he wasn't a good pitcher but why not give him more than 19 PAs to see what a guy like that can do. Not at catcher, of course. But at 2B, CF, (where he'd never played before), and at 3B, where he made that one error that time, so of course he's no good.And then, he didn't put himself in the game when somebody, anybody, should have been PH'ing for BWilson in crucial situations, or anything like that. If MoY is in the dugout, does anyone from AAA actually get a real "shot?" You forgot his shot at pitcher! And for that, I envy you. Btw, as a sixth grader, I pulled it off at second base once in a 'midget league' game at Midvale Elementary in Madison. The kid's mother, on the sidelines, complained to the umpire bitterly. This! One of Astudillo's "problems" is he is a baseball player, who doesn't look like a baseball player. And it would take far more imagination than MOY has for that to be seen in the Twins dugout. True MOY does not take a guy who has never played a position before, stick him there, and use that as a measure of his talent. Oh wait, I said a true MOY! I don't know how much success Astudillo would have in MLB over the long haul, but I do know he is better than some of the players currently on this roster. Astudillo would've been a regular under Gardenhire. That's all I have to say. Blake Snell struck him out on July 12. They sent Astudillo back down to AAA after that. It is amazing that you knew that! It is amazing what baseball-reference.com will tell you if you ask it courteously. Courteously? Oh, that's my problem. You can have him as the third catcher. But chances are he will NOT get a September callup for some unheard of reason and drift away to another organization. Ron Gardenhire on Line 3! Seems like Dougie Fresh should have told his young charge just that.